With spring riding weather soon here, I wanted to recap my visit to Hutchinson, MN. A bike-friendly community with Minnesota’s hometown feel and small town charm it is worth checking out. A short drive west of the Twin Cities, it’s one of those areas where it’s easy to lose track of time as you enjoy all the fresh air. Arriving in town you have several biking options with several lakes and parks nearby for added recreational pleasure. If you enjoy pedaling around, over driving, the whole area is very accessible so you’ll have no trouble creating some new memories. 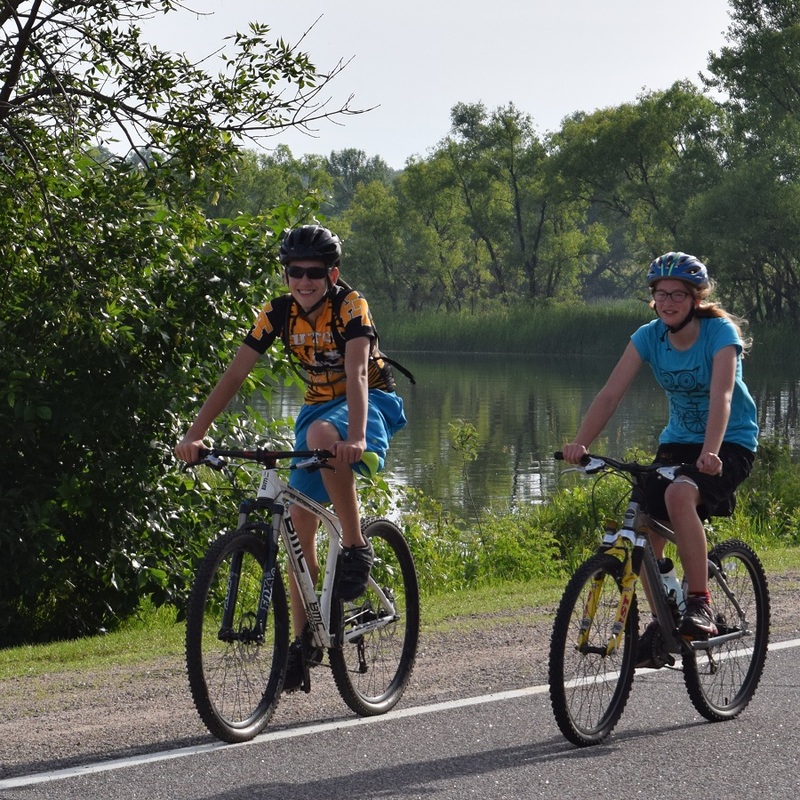 Riding the Luce Line Trail through Hutchinson on the Jaycee’s Water Carnival, June 8th. Aside from mountain biking, trail riding and the countryside touring opportunities here are plentiful, more than you can take in. You can immerse yourself in the local arts created by those who take inspiration from the natural beauty around them. Spend some time learning about the town’s history and how it all came to be. Or, if you are looking for unique place to eat or a gift to take home, there are plenty of opportunities waiting for you to discover. Located a little over an hour from the Twin Cities, the community here is also known as ‘Minnesota’s Hometown’. It’s a great place to escape the often road-rage inducing atmosphere of the big city. Here you can ride the Luce Line State Trail to clear your mind and let the calm country scenery work its magic. To start your day and plan your ride, nothing is better then McCormick’s Family Restaurant, in Hutchinson. Voted the number one place for Eggs Benedict in Minnesota, their pancakes and waffles are good too. When it comes time to take a break from pedaling there is no shortage of attractions to keep your adventure moving forward. Hutchinson has its share of one-of-a-kind eateries and if you’re looking for some more action outside you can try your hand at some paintball. Its easy to get out to Stahls Lake Park, from Hutchinson. Like many small towns in Minnesota, pedaling around isn’t difficult. Here in Hutchinson there is one big trail system that takes you beyond the town limits. In fact you can ride the trail all the way to the Twin Cities. You will find a few mountain biking opportunities if you’re up for the challenges you will see below. The Luce Line State Trail stretches 63 miles (from Plymouth to Cosmos) and is a popular attraction for bikers, hikers, snowmobilers, and equestrian enthusiasts. 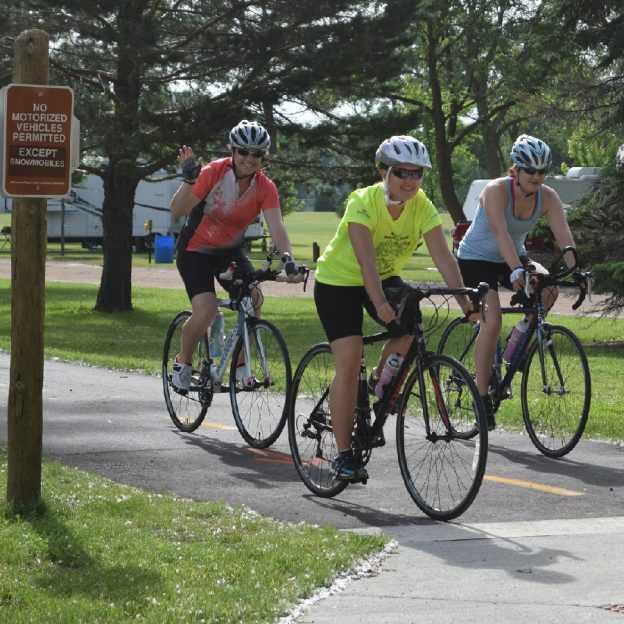 The paved trail includes about 21 miles, from the west Carver County line, through Hutchinson, to the west McLeod County line, just outside of town. To learn more about the Luce Line, go to www.luceline.com. To take in the Jaycee’s Water Carnival, plan to visiting the week of June 8th. Tartan Park is located in Hutchinson and is a skills park that is perfect for beginners to advanced mountain bikers. Those wishing for more than paved, level trails are in luck. 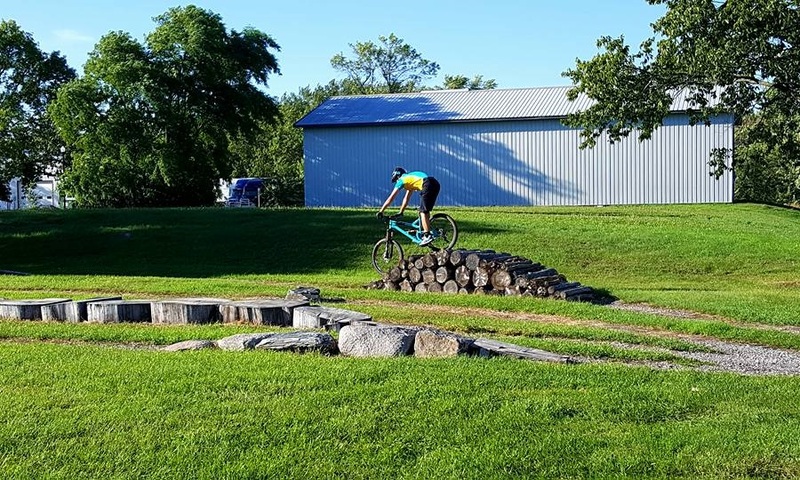 Thanks to the Hutchinson Area Mountain Bike Association, there are two tracks within reach: Tartan Terrain Park and Stahls Lake Park. Tartan Park is located in town limits and is a skills park that caters to beginners and advanced (see video). If you want to venture outside the town limits to Stahl’s Lake Park, there’s a nice single-track that caters to all experience levels. Two double track loops range from .5 miles to 1 mile long. One single-track loop is over 2 miles. Like many of Minnesota’s smaller communities, navigating the area on your bike couldn’t be easier. The roads allow you to see all the area’s beautiful scenery, perfect for your next Instagram post. You can use the roads to explore the area’s parks, shops and more. Plus, you will find plenty of city trails that help you around as well. 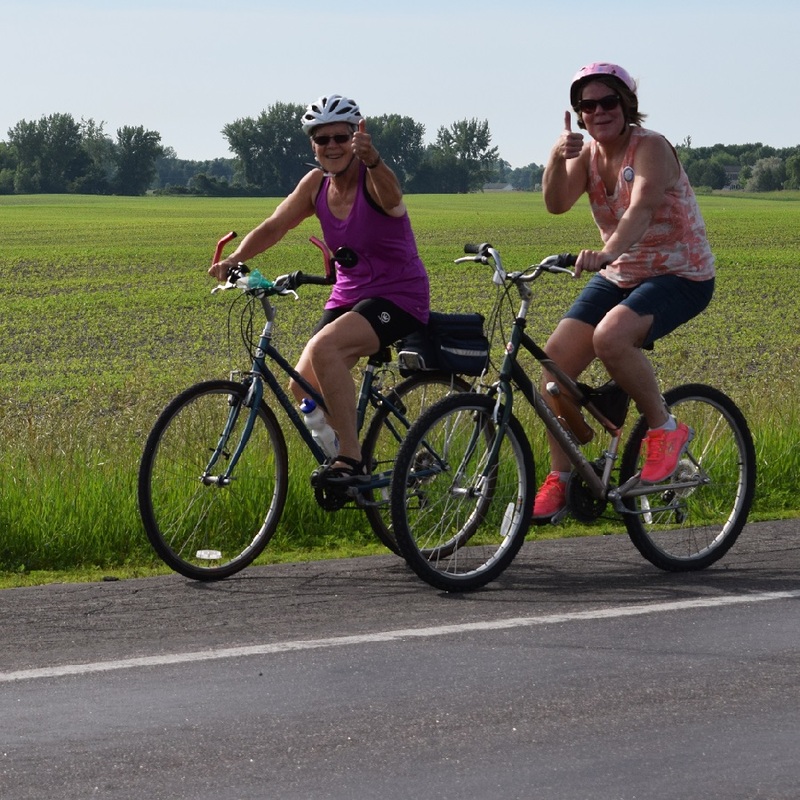 See the MnDOT county bike maps for both road and gravel opportunities. 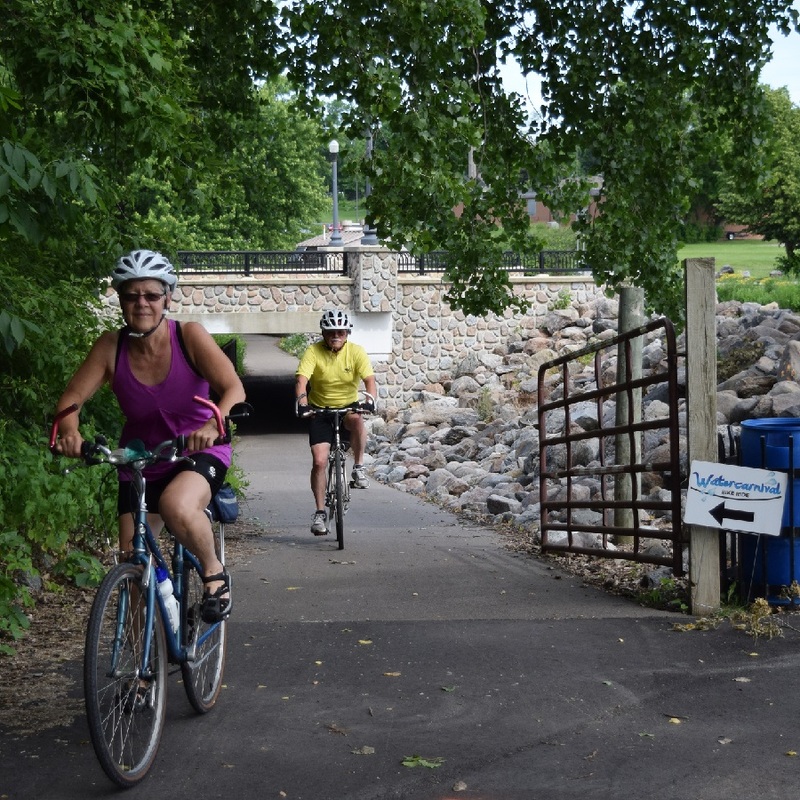 Come, enjoy the bike-friendly fun in Minnesota’s ‘hometown feel’ of fun. For more information on playing or staying in a community with Minnesota’s hometown feel. Check out our HaveFunBiking, At-a-Glance Hutchinson article for your next bike adventure. For places to stay and camp grounds see Explore Hutchinson. This entry was posted in News and tagged Bike around Minnesota, bike guide to Minnesota, bike minnesota, bike touring, bike tourism, biking Minnesota, Explore Hutchinson, Hutchinson MN, Luce Line Trail, Minnesota bike destination, Minnesota Bike Trails, Minnesota trails, MnDOT Bike Map, Mountain Biking, road bike, Road Biking Minnesota, Stahls Lake Park, Tartan Park, Western Minnesota on April 16, 2018 by Andrew Ellis.